"Worth taking a trip on Discovery Trail. [On Tuesday I had] Kingfisher, 12 Bufflehead , Common Mergansers, Pintail, N. Shovelers, Harrier, Red-tailed Hawk, Gadwall." Seen by others morning: Dark-morph Rough-legged Hawk by Disposal Road's Retention Pond area, and a Ruby-crowned Kinglet at DeKorte's Lyndhurst Nature Reserve. No shrike reports yet today. The Northern Shrike was seen several times on Sunday, including during the Jets game — by a diehard Giants fan. We did not look for Mr. Shrike Monday because of the rain, but will try to get out today and update this post as needed. 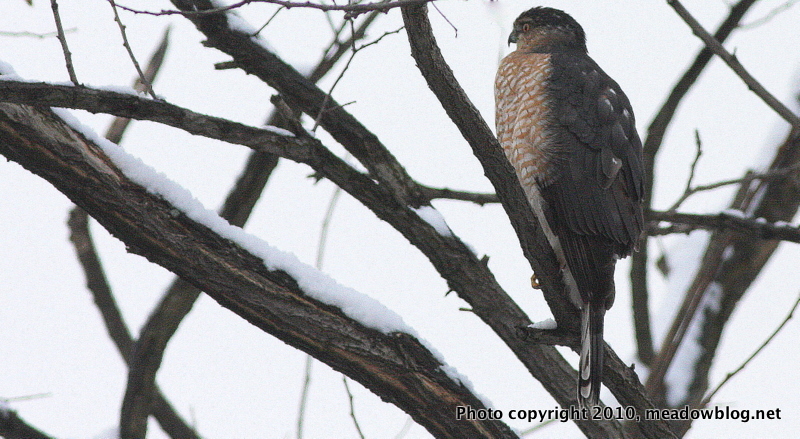 We saw this accipiter perched by Harrier Meadow on Dec. 31. Do you know which kind?